In the first-ever meeting between the two teams in Columbus, No. 6 UC Irvine men’s volleyball shocked top-seeded Ohio State Saturday evening when they swept the Buckeyes, 3-0 (28-26, 25-19, 25-20), leaving the 1,321 fans at St. Johns Arena in awe while effectively snapping a 42-match win streak that began in February of last year. With straight-set victories over Saint Francis (8-12) and No.12 Ball State (15-6) prior to Saturday, UCI (15-6) is now rolling on a three-game win streak and have not given up a set since their 3-2 win over CSUN (12-10) two weeks ago. UCI (15-6) had a strong offense evening, outhitting Ohio State (19-1) .361-.222. On the receiving end of the net, the ‘Eaters had 35 digs and were narrowly out-blocked, 9-8. The Buckeyes, however, did hold the advantage at the service line, with nine aces to UCI’s three. 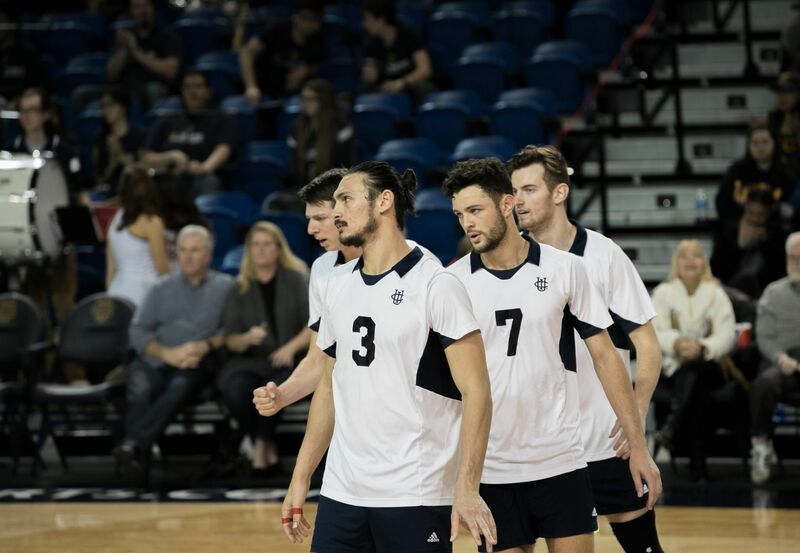 Junior Aaron Koubi — along with seniors Tamir Hershko and Thomas Hodges — led the attack for the ‘Eaters, as Koubi finished with a match-high 13 kills by way of hitting a .455 clip, while Hershko and Hodges contributed 11 kills apiece. Senior Michael Saeta hit an errorless .833 on the evening for five kills to go along with 27 assists, eight digs and two aces. Senior Miles Johnson managed to record a team-high 12 kills for the Buckeyes, but hit just .147. It was a Johnson kill that gave Ohio State a 15-10 lead in the opening set, forcing the ‘Eaters to call a timeout. The Buckeyes added another point on a rejection that turned a Hershko attack back, but the ‘Eaters stayed calm and slowly chipped back, going on a six-point run of their own with help from Hodges and Koubi, who each spiked down two aggressive kills in a stretch that would bring the game to a draw, 17-17. Going down the wire, the set would see nine more ties. Tied 26-26, Koubi and Hershko came up with back-to-back kills to hand Ohio State their first opening set loss since their season opener back on Jan. 6 against USC. Hershko and Koubi carried over the momentum into the second set on back-to-back kills to put UCI up early, 2-0. Koubi would later strike again, and with two consecutive kills from Saeta, the ‘Eaters held a three-point advantage at 11-8. A kill from Hodges and two stuffs from Youngren gave UCI their largest lead at 21-15. Hodges brought the ‘Eaters to set point, but the Buckeyes kept the set alive on a Johnson kill and a triple block to force a late time out to regroup. UCI would do just that as freshman Scott Stadick rose up with a huge block on a Johnson attack to take the second set, handing the Buckeyes their first two set deficit of the year. In the same period, UCI also held Ohio State to just .156 hitting, one of their lowest percentages on the season thus far. On the third set, the ‘Eaters earned the opening point on an Ohio State error and did not look back from there, as they would go on to hold the lead for the remainder of the set. The ‘Eaters built a 7-3 lead that was capped with another Stadick block. The Buckeyes raced back with a four-point run that evened the score at 9-9. Saeta and Hershko would not allow the Buckeyes to claim the lead, with two straight kills to pull UCI back up, 11-9. The match then swung completely to the ‘Eaters favor as they went on an 8-1 run. Kills from Koubi and Hershko took the ‘Eaters to match point, 24-16. Ohio State managed to come within four with a string of Johnson strikes, but Hershko would drop the hammer to complete the upset, 25-20. On their recent hot streak, UCI will have a week to prepare before heading to Firestone Fieldhouse for a 7 p.m. match against Pepperdine.